Couple of days ago a was out in Imst and Imsterau (Walter, you know what I'm talking 'bout ) to shot some night scenes... on the way to Imsterberg I was driving along a small country road (?) with a lot of barns on both sides. So I decided to give it a try... I stopped the car beside the road, leaving the high beam on to lighten this old hat... I wanted to create something that has this "spy-look" I really love and admire - Kevin, your shots are so inspiring! I hope you like this photo as much as I do - and please give me your C&C! Last edited by maggo85; Mar 27, 2010 at 10:23 AM. Markus, this is truly a magnificet photo, in spy-style! Good work and contrast, IMO. 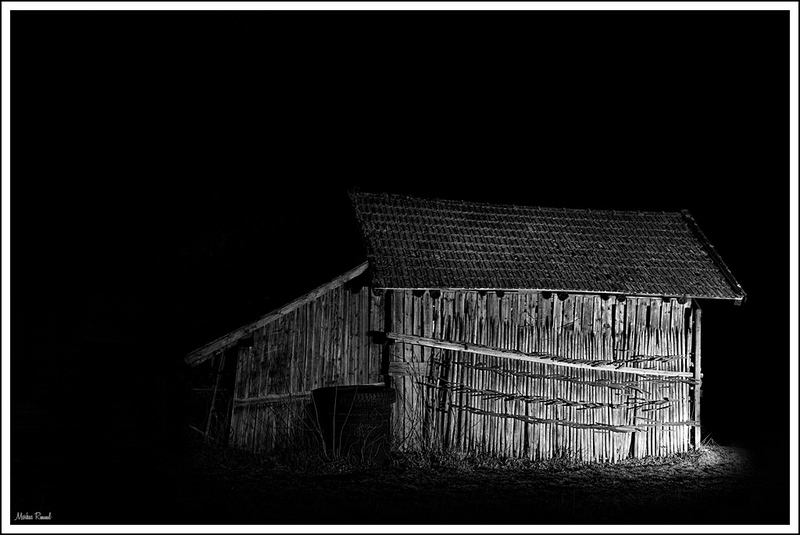 Next time bring along a flashlight and get your wife to run around on the backside of the barn and shine (light-paint) the silhuette of it! Excellent work Markus, and a great suggestion on the backlight Walter! Very nice. I always carry a million powered torch in my back pack. Very useful for these type of shots, plus it helps when it comes to auto focusing in low level light situations. I am honoured and extremely impressed with your trying out new ways of introducing light to your subject. Isn't it amazing how using your car headlights can work out so well!! You have a decent blend of light here and were careful not to blow the highlights on the far right then gently leading the light off on the left leaving me wondering what is beyond. This shot is captivating. Walter gives an excellent suggestion for another shot. Just to add to his idea, if you can position your camera to include a full moon directly behind to back light your subject along with forelighting using your car's headlights again or flashlight. What works very well too is to use a full moon in the background on a very foggy early morning when it's still dark. My hat is off to you bro. This rocks! Last edited by spy; Mar 27, 2010 at 12:44 PM. Wow... thank you all so much for your kind words - reading comments like your's makes me feel that it was really worth the work!! Markkus! Really nice work! Very good use of lighting. Spy is quite an inspiration to all of us. Anyway, really nice photo. Thanks for sharing it.